Announcement Need a creative gift for a creative person? Shop here for awesome buttons, magnets and more! 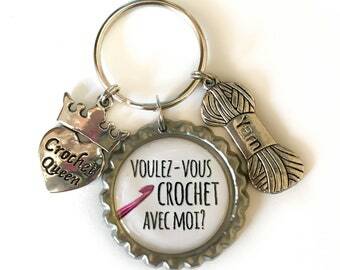 Unique gifts for knitters, crocheters, quilters, stitchers, and anyone who is handy with a glue gun. Need a creative gift for a creative person? Shop here for awesome buttons, magnets and more! Unique gifts for knitters, crocheters, quilters, stitchers, and anyone who is handy with a glue gun. 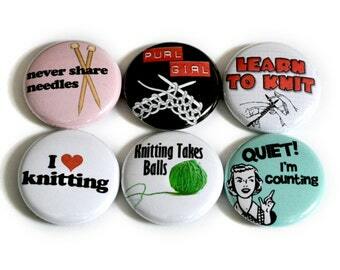 Knitting Pinback Badges or Small Knitting Magnets - Inexpensive Gift for Knitters - Knitting Stocking Stuffer! 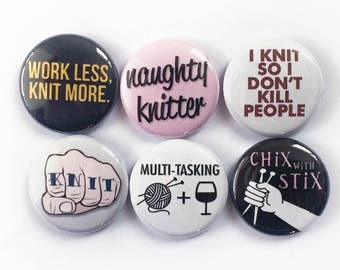 Funny Knitting Sayings on Pins or Magnets for Knitters | Small Present for a Knitter | Accessorize Your Knitting Bag! Ordered for a friend - they loved them! Pinback buttons are a fun letterboard accessory! This is my last wine stopper, but don’t worry, I’ll make more!! Each button is inspected by my quality control officer. My buttons have traveled far and wide! 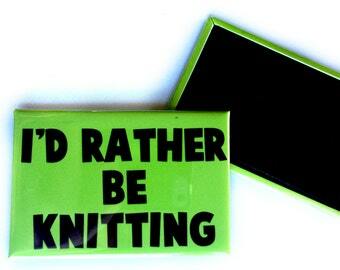 My products are dedicated to all you knitters, crocheters, quilters, and crafters out there. What you do is fun, funky, and totally cool and the world needs to know about it. So raise your glasses, wear your buttons proudly, and remember to share the love. Do your best not to get buttons, magnets, or wine charms wet to avoid any potential rust issues. Do not put any of my items in the washing machine or dishwasher. I don't keep a large number of items in stock and often make your order as it comes in. That's why I leave myself a long processing window (usually a week). If you are in an ASAP situation, please message me and I will do my best to expedite the process for you. Unfortunately, I do not accept returns absent special circumstances. Please let me know immediately if there is a problem with your order and I will make it right ASAP!